* The Celtic Christmas Podcast is brought to you through the generosity of the Patrons of the Irish & Celtic Music Podcast. You can become a patron and support Celtic music for as little as $1 per episode of the Irish & Celtic Music Podcast. 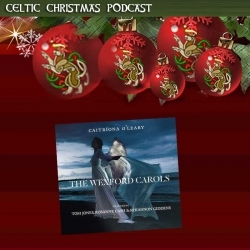 Doing so will give the gift of Celtic Christmas music to Celtic music fans around the world. Make a pledge today! * If you enjoy this podcast, then please rate the show on iTunes or your favorite podcatcher. * Then subscribe to our Celtic Music Magazine. This is our free newsletter and your guide to the latest Celtic music and podcast news. Subscribe today to download 34 Celtic MP3s for free. How's that for a Christmas gift? And Remember to support the artists who support this podcast: buy their CDs, download their MP3s, see their shows, and drop them an email to let them know you heard them on the Celtic Christmas Podcast. The Celtic Christmas Podcast was produced by Marc Gunn. To subscribe, go to iTunes or to our website where you can become a Patron of the Irish & Celtic Music Podcast for as little as $1 per episode. Spread the holiday cheer. Share this podcast, then visit CelticChristmasMusic.net for more details about the artists in this show. Merry Christmas!